BSP supremo Mayawati today warned the Muslim electors in Uttar Pradesh against voting for the Samajwadi Party. LUCKNOW: BSP supremo Mayawati today warned the Muslim electors in Uttar Pradesh against voting for the Samajwadi Party as there votes will not only go "waste" but directly benefit BJP. "If you vote for Samajwadi Party, not only your vote will go waste but may directly benefit the BJP. 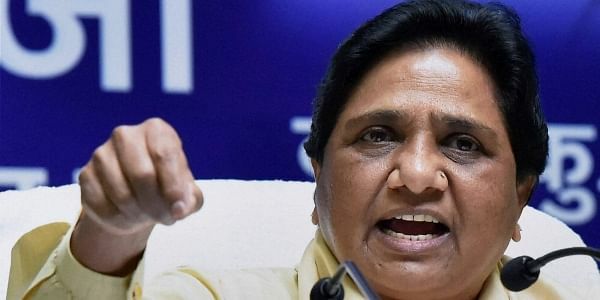 You should vote en masse for BSP and not SP," Mayawati told election rallies in the poll-bound state, in remarks that fly in the face of the Supreme Court verdict on use of religion during elections. The Supreme Court had last month ruled that any appeal for votes on the ground of "religion, race, caste, community or language" amounted to "corrupt practice" under the electoral law. phases of polling," she said in a statement in Lucknow. Referring to Modi's "graveyard-cremation ground" and "Diwali-Eid" comments, Mayawati said such a view was aimed at giving casteist and communal colour to polls. At his Fatehpur rally on Sunday, the PM has said each village needs to have a graveyard and a cremation ground and the people should get power on Diwali as well as Eid without discrimination. She said the Prime Minister should get cremation ground in each village in BJP-ruled states first and then talk about it in Uttar Pradesh. "Such kind of wrong statements prove that they have stooped to politics of lies," she said, adding BJP has "lowered" the level of politics which is not good for democracy. "PM says BJP does not indulge in caste and communal politics, but this is wrong," Mayawati said, also citing the Rohith Vemula case. Rohith Vemula was a research scholar at University of Hyderabad who had committed suicide last year alleging discrimination on the basis of caste. She said BJP has not given ticket to even a single Muslim candidate in UP which has some 18 to 20 per cent population of the community. Mayawati's party has fielded nearly a 100 Muslim candidates in the state which has a 403-member assembly. Addressing an election rally in Gonda, Mayawati warned," "If BJP wins, it would not hesitate in implementing the agenda of the RSS. This means that either the system of reservation would be brought to an end or it would be rendered virtually ineffective." The BSP chief also criticised the Centre for taking steps to end the minority status of institutes like Aligarh Muslim University and Jamia Millia Islamia. In the aftermath of the firing on the Kar Sevaks at Ayodhya in October, 1990, when Mulayam Singh Yadav was the Chief Minister, and the demolition of the Babri Masjid, Muslims, traditionally the vote bank of the Congress, have backed Samajwadi Party. Some in the community have also been voting for BSP, with a minuscule percentage going to Congress. Seeking to engineer a Dalit-Muslim combination, Mayawati decided to field nearly 100 Muslims. However, with Samajwadi Party and Congress forming an alliance, the lion's share of Muslim votes are expected to go to the new combine.